Aylward has produced a translation of works explaining the philosophical concepts and the conceptual basis for the techniques used in Chinese astrology and Feng Shui (geomancy). The bulk of the book presents key chapters from the “Treatise on Harmonizing Times and Distinguishing Directions” commissioned by Emperor Qianlong in the 18th century. This document was intended to reconcile technical disagreements about methods used in both fields. The Treatise compiles and synthesizes information from older manuscripts, and Aylward also includes notes or passages from other books with contradictory information to offer contrasting viewpoints. Sometimes these contrasts came from methods used by different schools, while some represent methods used by different types of practitioners. The contents include a variety of uses and functions of the eight trigrams from the I Ching (a.k.a., Yijing). The trigrams can be manipulated into various orders and arrangements that are applied in both astrology and feng shui. The astrological components include the branches (twelve zodiac signs) and stems (the five elements) and how these are combined to produce the 60-year pattern of birth years that is more-or-less well known in the west. End-of-book material includes endnotes, a glossary, bibliography, and an index. The system of the trigrams, stems and branches is synthesized in the feng shui tool called the luopan, or the divination compass. The orientation and interrelationships of markings around the three circles of the luopan is explicated from the basis of these methods. Divining appropriate housing for the living is different from divining burial grounds, and the variations of these different methods are included. There are copious diagrams of the arrangements of trigrams, stems and branches, and luopan circles. Aylward annotates the various sections with insightful remarks on the consistency, origins, or variations of concepts. The contents of the Treatise include many repetitious lists of relationships and interrelationships; some additional grid forms would have been helpful. The Chinese almanac, called the tongsu, gives the current combinations for year, month, day and hour, but I have yet to find an English translation of that annual almanac. Of all the things the Chinese import for American consumers, they pointedly neglect to offer what might well be their most valuable export! I have never found a book in English giving explicit instructions and examples of using the luopan, either. Readers should be aware that in getting this book, they’re getting a car without the wheels: basic concepts without information on application. This book begs a follow-up text! There is no indication that Aylward intends to write one, so a capable person well-versed in these skills should consider producing such a book. 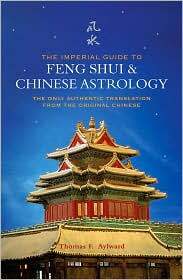 There is a huge gap between overly-simplistic books on Chinese astrology and feng shui and Aylward’s translation that needs to be filled. This book is recommended with the proviso that the reader understands the material offered in this book is devoid of instructions for application.